Looking for a Keto friendly, low carb stuffing for your holiday meal? This one is delicious and healthy for you! 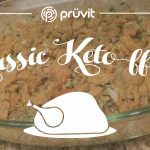 Klassic Keto-ffing or Keto Stuffing is perfect for your Christmas or Thanksgiving dinner! This low carb version will keep you on track with your Keto lifestyle even during the holidays! By the way, it tastes amazing, so you won’t miss the high carb stuffing you might be use to eating! This is also a diabetic friendly stuffing recipe. So if some of your guests or family require a low carb and low sugar meal this is a great addition! 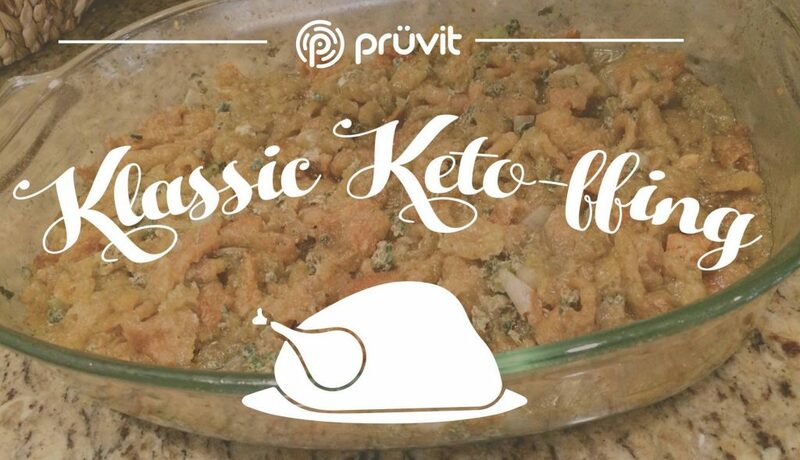 I hope you enjoy this keto stuffing with your turkey as much as we did. Feel free to cook separately or stuff your turkey with it! Melt 2 sticks of butter in a large skillet over medium heat. Add 1 cup of diced onions and 2 cups of celery and 1 tablespoon each minced sage and thyme; add salt and pepper and 3 tablespoons of bacon grease and cook 5 minutes. Add 2 cups of chicken bone broth and bring to a simmer. Beat 1 whole egg and 1 egg yolk with Â¼ cup chopped parsley in a large bowl; add 16 cups of roughly crushed pork rinds, add 1 cup of bacon pieces, then pour in the bone broth mixture and toss. Transfer to a buttered baking dish and dot with butter. Cover and bake 30 minutes at 375 degrees, then uncover and bake until golden, 30 more minutes.